"For a better tomorrow," remarks one character in a rare moment of downtime in John Woo's Manhunt, drawing a direct connection to Woo's 1986 break-out hit. Not that he needed to drop so blatant a callback. 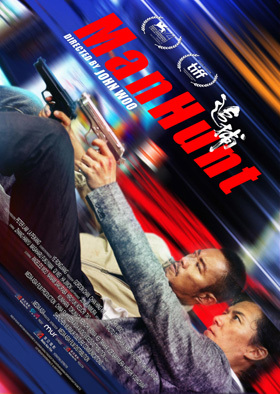 Released in 2017 across Asian cinemas but debuting on Netflix in the U.S., Manhunt is a self-conscious throwback to the Hong Kong films that made Woo's reputation among action movie fans around the world––a gleefully overstuffed thriller that races through the greatest-hits-of-Woo trademarks, right down to a hardboiled cop who bonds with his nemesis as he pursues him across the city. Du Qiu (Zhang Hanyu) is a Chinese lawyer in Osaka for the anniversary of a Japanese pharmaceutical company that's harboring secrets it's willing to kill to protect. Yamura (Japanese pop star Masaharu Fukuyama) is the maverick detective introduced brazenly disregarding protocol and good sense as he improvises a rescue of a child kidnapped by crazed criminals with a tanker truck of toxic chemicals wired to explosives. When Du Qiu wakes up with a dead woman in his bed and a price on his head, Yamura joins the chase. Before long, the two become partners fighting a conspiracy that targets them both, resorting to English to communicate across the language divide (a neat idea that, in practice, only draws attention to Woo's prosaic dialogue). There's also a hitwoman buddy team leaving a trail of blood-spattered corpses in their wake, the young widow of a chemist who mysteriously died after refusing to sell his formula to the drug conglomerate, lap dissolves, a dance number, a jet-ski chase, a spray of doves slow-motion circling a mano-a-mano battle, a bond formed over a shared affection for old movies, and betrayals that make this fight personal. Based on a 1976 Ken Takakura film of the same name, Manhunt drops Woo's classic 1990s-style Hong Kong gun-fu gangster opera into the cosmopolitan culture of contemporary Osaka, applying modern moviemaking tools to a blast of outrageous set pieces with a mix of tough-guy machismo and sentimental emotion. It's not as jaw-droppingly astonishing as in Woo's heyday, but still glorious to behold at its best. Forget ambiguity or shadows of corruption slowly enveloping anti-heroes. These are saints versus sinners, beholden to moral certainty and personal loyalty, in a world shot in the bright, bold urban imagery that Woo favors––the better to see every vector of colliding force in elaborately choreographed action scenes. I've missed the John Woo of A Better Tomorrow, The Killer, and Hard Boiled, the Hong Kong director whose runaway action chops and male-bonding melodrama created a genre in its own right. Manhunt isn't quite a return to form, but the sheer kinetic joy of his filmmaking is a tonic in an era of superhero overkill.